Successfully Added Big Screen TV Phone with Dual SIM to your Shopping Cart. Classic Big Screen TV Phone with Dual SIM card slots. Just can't get enough of those Simpson's reruns? Get yourself this UNLOCKED big screen TV phone so you're well entertained wherever you are, whether it be on campus or during the big commute. This dual SIM unlocked phone is packed full of features, by using 2 SIM cards you can keep your business life separate from your personal, even assign different rings to each SIM, or the work SIM off while you're spending time with the family. Multimedia functions are well taken care of, with a great video / still camera combo, sound recorder and great 3GP and AVI playback over the full width of the 2.8 inch LCD. The responsive touchscreen and finger friendly menu system will get you around the menu system lightning fast and there's even a hidden stylus for character entry. Another great jewel in the Chinavasion mobile phone crown available direct to you at absolutely stunning wholesale prices. 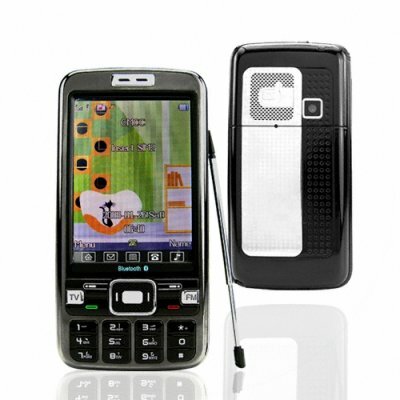 NOTE: This GSM cell phone is a tri-band compatible with GSM at 900MHz, 1800MHz and 1900MHz. Please check with your local provider if you are unsure of your local band requirements. on 2009-02-20 05:59:09 perfect phone. i have it nearby a year , it works perfect with no problem , and i keep it for my private use. very recomend.